I've posted about Robert Frost on this, and my other blogs, many times. It seems I've neglected the surprising number of other poets who have made New Hampshire their home and inspiration for at least part of their lives--Celia Thaxter, Richard Eberhart*, Philip Booth, Donald Hall*, and his late wife, Jane Kenyon*, Maxine Kumin*, Charles Simic. The ones with an asterick * have been named New Hampshire Poets Laureate. Other poets laureate are Walter E. Butts, the current laureate, Patricia Fargnoli, Cynthia Huntington, Marie Harris, Eleanor Vinton, and Paul Scott Mowrer. Here's poem by Paul Scott Mowrer that has New Hampshire written all over it. Our blossom-beds they tear to disarray. They fear no nuthatch, woodpecker or jay. out of sight, But then pop up again, eyes blinking bright. Our chase each other madly-chase is fun. Even as I write, I hear the lone "tick-tock"
Of a lovelorn chipmunk, upright on some rock. The chipping sound that I always thought was made by a bird, turns out to have been made by a chipmunk. I only realized this a year or so ago! Talk about clueless! 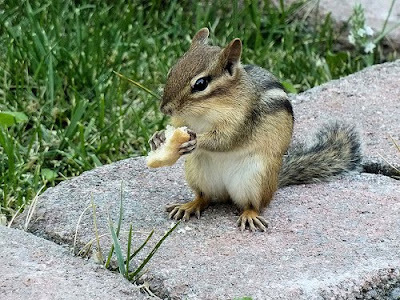 If you are unfamiliar with the sound a chipmunk makes, click here (courtesy Partners in Rhyme). Head over to Wild Rose Reader for this week's Round-Up and say hello to Elaine! We suffer from an overabundance of chipmunks here in CT. They are working hard to collapse two retaining walls in my yard (perhaps they are the unseen force that 'doesn't love a wall) and they have dug so many tunnels under my front porch that the cement has shifted by 3" in one corner! Despite all that I have a soft spot for them -- they are so darn cute. I even rescued one that fell into my pond last spring. NH is often given credit for Celia Thaxter when in fact, she lived in Maine, on Appledore Island. Appledore is now a Marine Science Laboratory run by Cornell University and UNH. Celia Thaxter's restored gardens can be visited there in the summer. My facebook status from earlier this week reads: "Every chipmunk in Hall County (Ga.) lives in our yard." ;0) So I appreciate this poem! I didn't realize they made that bird-sounding chirp either until we moved into this house several years ago. I love them, too. Thaxter was born in Portsmouth, so we have every right to claim her as one of our own! The Shoals Marine Lab is jointly run by Cornell AND UNH.